Windows XP has become an orphan. No, its parent is not dead. But Microsoft essentially disowned its progeny as of April 8, 2014. From that date, no WinXP security updates from Microsoft will ever again be available. Computer security experts are agreed that the loss of ongoing Microsoft support makes WinXP far more vulnerable to attacks by hackers than it was when its parent was plugging security gaps on a weekly basis. They are almost unanimous in their recommendation that the millions of current users of WinXP move as soon as possible to an alternative operating system. But where can beleaguered WinXP users go? Many have neither the desire nor the means to buy the new hardware and software that would be required to follow Microsoft’s approved migration path and upgrade to Windows 7, 8.1, or 10. My church is in that category. We have developed a plan that involves continuing to use WinXP in the short term, while gradually changing over to a new OS for long term stability. (See How To Safely Use Windows XP After Microsoft Ends Support). 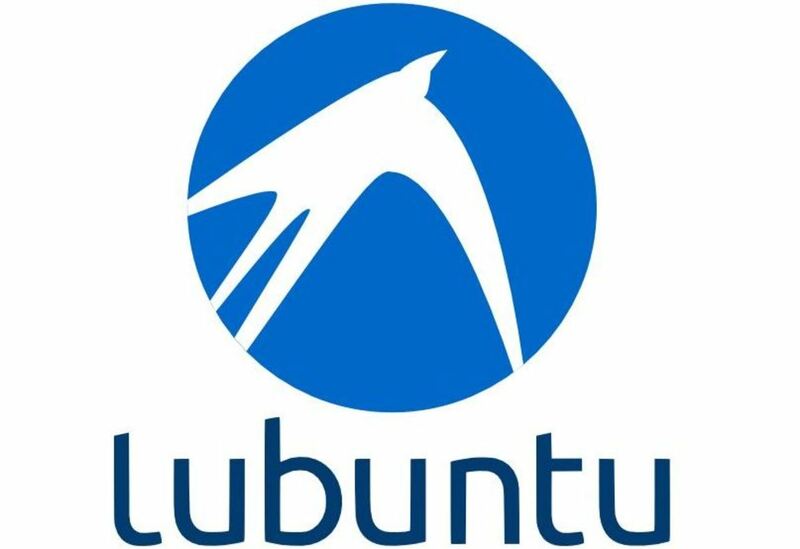 The operating system we plan to migrate to is Lubuntu Linux. Lubuntu is a member of the UNIX family of operating systems, and is a direct derivative of Ubuntu. What are Ubuntu and Lubuntu? The philosophy behind Ubuntu is to provide a freely available, open source operating system that includes the most used capabilities of Windows without the expense and disruption involved in having to keep up with the Microsoft product cycle. Like Windows, Ubuntu and Lubuntu have a graphical user interface (GUI) that makes it easy for non-technical users to navigate. Anyone familiar with Windows in its various incarnations already understands the concept of how the Ubuntu GUI functions, though, as we’ll see, the details can be quite different. The entire Ubuntu family has some unique features that make it a great alternative for those looking to migrate from Windows XP. Linux is inherently a more secure environment than Windows. It has built-in protections against hacker intrusions that make it far less vulnerable than WinXP. Ubuntu and its derivatives are open source and entirely free, though paid commercial support is also available. Ubuntu comes with a wide selection of free software preinstalled, including such apps as the Firefox or Chromium browsers (Chromium is a Linux implementation of Google’s Chrome), and many others. In addition, there’s a Software Center where any of hundreds of free apps, such as the LibreOffice suite (an open source equivalent of Microsoft Office), can be quickly and easily downloaded and installed without having to individually hunt for them. In my opinion, this is one area where Ubuntu and its derivatives far outshine WinXP. The Ubuntu family is stable and well supported, with more than 20 million users world wide. Lubuntu is simply a lighter, less resource intensive descendant of Ubuntu. Ubuntu already requires far fewer resources than Windows. Lubuntu takes that philosophy to the next level. 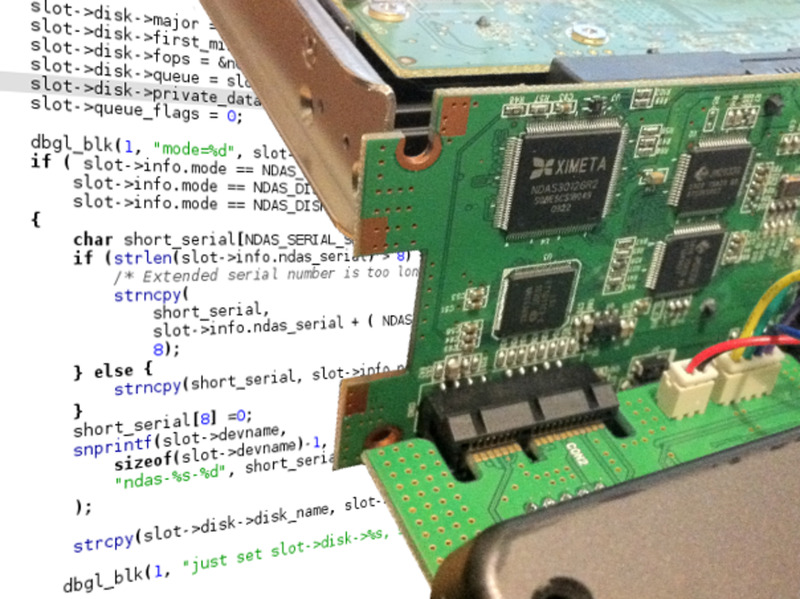 It is specifically designed to run on outmoded hardware with limited memory and cpu resources. For my church, the ability of Lubuntu to run on vintage computers that would otherwise be obsolete is crucial. We have Dell laptops and desktops that are more than a decade old. They are entirely adequate for the applications we run. Yet we couldn’t upgrade from WinXP to Windows 7 or 10 if we wanted to – our old hardware can’t run the new Windows versions. Our Dell Latitude D600 laptops are too old even for Ubuntu, because they lack a feature called the PAE extension, which allows the cpu to address more than 4 GB of RAM. But here’s where Lubuntu (version 12.04) shines. I was able to install it on the laptops with no problems, and it runs perfectly. Note that Lubuntu 13.10 requires PAE, but can still be installed on non-PAE machines by first installing Lubuntu 12.04, then upgrading to 13.10. I installed Lubuntu on a laptop and Ubuntu on a desktop PC. After working with each implementation for a while, I much prefer the Lubuntu incarnation. That’s basically because the GUI is closer to what I’m used to on WinXP. The Lubuntu desktop looks pretty much like the WinXP desktop. Programs can be launched by double-clicking icons on the desktop, or from Lubuntu’s equivalent of the Start button. You can also install shortcuts in folders and launch programs from there. 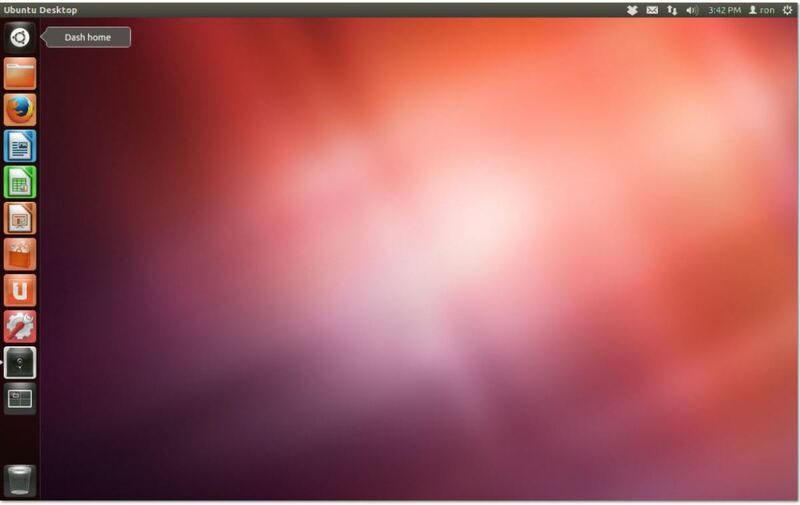 In contrast, the Ubuntu desktop is not intended to function as a program launcher. There’s no equivalent to the Start button, although the most frequently used apps are lined up along the left edge of the desktop. Other programs must be accessed by opening an application launcher window and searching for them. It’s not easy (apparently by design) to place shortcuts on the Ubuntu desktop so programs can be launched from there. In fact, I have yet to figure out how to do it. And for me, that’s the point: I have to invest far less “figuring out” time with Lubuntu than with Ubuntu. One of the great things about all members of the Ubuntu family is that you can usually find a way to configure their look and feel pretty much any way you want. 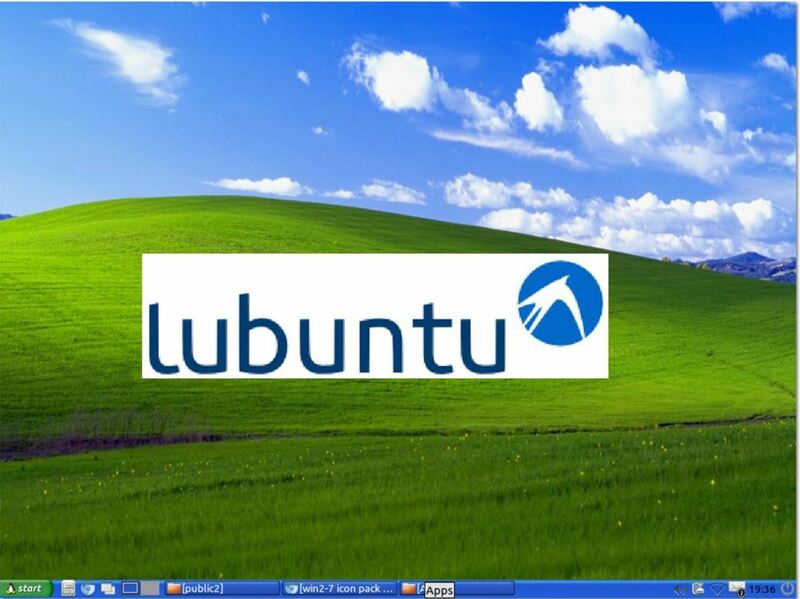 (See How To Make Lubuntu Look Like Windows XP). So I’m sure I could get the Ubuntu GUI to look more XP-like if I made the effort. 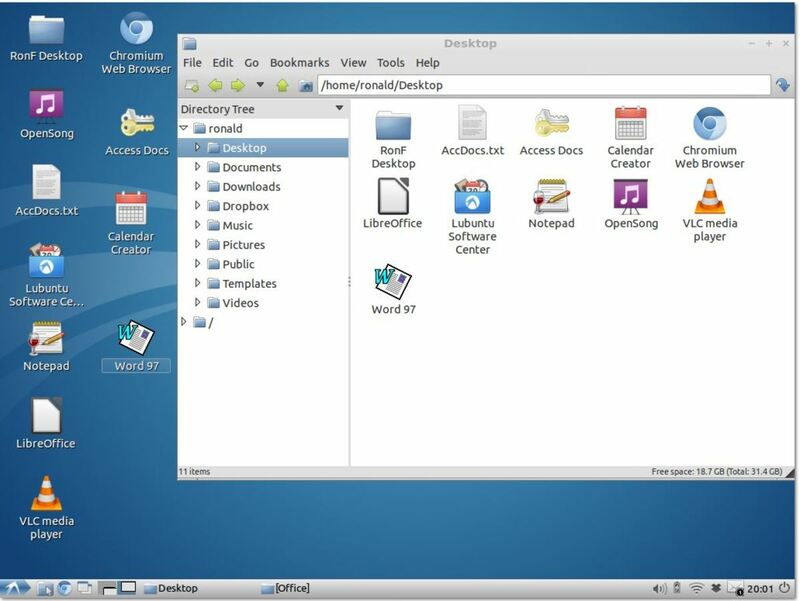 But Lubuntu presents a more familiar interface from the beginning. This is very important for our church because our volunteer workers are not, for the most part, very tech-savvy. So our goal is to minimize the “strangeness” factor in the switchover from WinXP to Linux. Lubuntu, in my opinion, makes that task much easier than does Ubuntu. What do you think is the best alternative to WinXP? I Don't Drink, but I Love Wine! Almost every commercial application that runs on Windows has an equivalent in the Linux world. And many times the Linux apps are open source and free. But for some specialized applications, Linux alternatives may not be available. For example, both for administrative tasks and for recording our worship services and producing sermon CDs, our church has several critical Windows apps we developed ourselves. Obviously, no Linux-based equivalents are available. That’s why, for us, one of the greatest advantages of both Ubuntu and Lubuntu is the availability of Wine, which originally stood for Windows Emulator. Wine is a Linux environment that allows the execution of Windows applications. Despite the original meaning of its name, Wine is not actually an emulator, but rather an independent implementation of the Windows API (Application Programming Interface). It translates, in real time, a program’s API calls into Linux commands. Thus, Wine can execute Windows programs just as fast (and in some cases actually faster) as they run under Windows itself. Although there are some Windows applications that won’t run under Wine, most do. 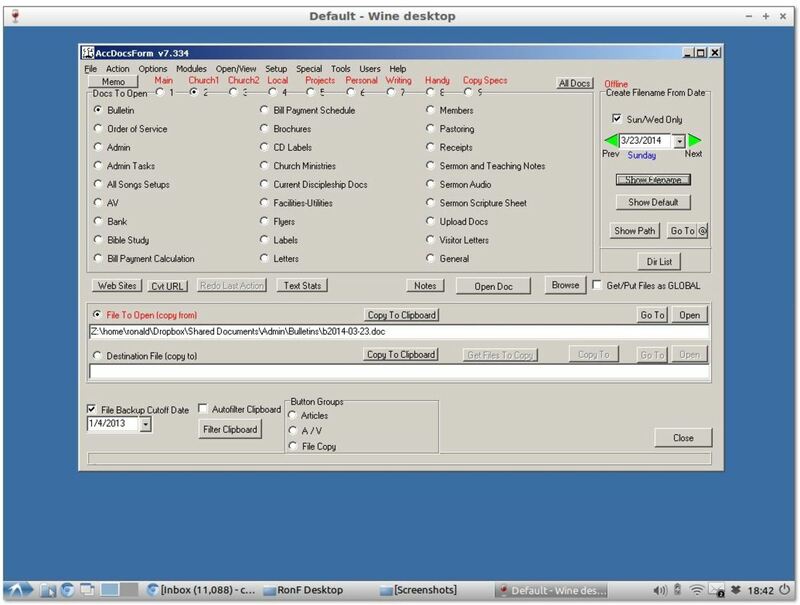 The Wine application database now lists over 21,000 Windows programs that can be used with Wine. I tested Wine on my Lubuntu 12.04 laptop and found that I it runs the Windows apps our church uses with no apparent problems. These include Open Song, which we use project songs, announcements, etc., during worship services, as well as the home-grown apps mentioned above. I also wanted to test some commercial products. I have an old MS Word 97 CD and was able to successfully install and run it under Wine. And here’s a way in which Wine actually surpasses WinXP for running Windows programs. Unlike the newer Windows offerings from Microsoft, Wine is backward compatible all the way back to Windows 3.1. So, I was able to run an old Windows 95 app, Calendar Creator 6.0, which won’t run in WinXP at all. Once Windows apps are installed in Lubuntu under Wine, they can be accessed via shortcuts on the desktop or in a window. When such apps are launched, Lubuntu recognizes them as Windows executables and automatically invokes Wine to run them. The great thing for our church in using Wine is that our technically unsophisticated volunteers will be able to run the same apps they always have, and may not even notice that the underlying operating system is totally different. The major disadvantage of Lubuntu for a small organization like our church is that the level of technical knowledge required to set up and maintain a Linux-based system is far greater than is normally required for Windows. If you are anything like me, just getting started is going to take a lot of online research, a lot of stumbles and mistakes, and a lot of pain. One reason for this is that Linux remains much closer to its command line roots than is Windows. In both systems the user interface is designed to allow tasks to be accomplished just by pointing and clicking with a mouse. But there are many functions in Linux that are more quickly performed by entering esoteric commands in a terminal session. In fact, there are some things that can only be done that way. To get that printer driver installed and functioning took me hours. First I had to do all the internet research required to find out what to do. Then more time was required to work through all the information gaps, oversights, and mistakes I had to overcome in order to finally get it to work. And I’m someone who not only has a technical background, but who actually worked as a UNIX System Administrator at one time in my engineering career! (But, to be fair, that was decades ago). Part of the issue, from my perspective, is that the Linux community seems very technically (rather than user) oriented. There’s plenty of information and help available; but, in my opinion, it's not coherently organized, and much of it assumes that users are both sophisticated about Linux and comfortable entering cryptic commands at the keyboard. You will be required to learn about kernels, tars, and torrents, and any number of other things you never heard of before. For Linux novices trying to make the transition from Windows to Lubuntu, it can all be a bit daunting. But it’s doable. It just takes commitment and time. The great advantage of deploying Lubuntu as our church's desktop standard is that regular users don’t have to get into all these technical details. Someone will have to get their hands dirty to set up and maintain the system, but not everyone. That’s why I think it’s reasonable to aim at making the transition from WinXP to Lubuntu one our average user hardly notices. i ran peppermint linux on a non-pae laptop . I remember also there was something called "fake pae" that you could use to trick a linux iso into installing ok. I think i still have the files somewhere though it's possible a better way to do it has evolved since then. Ubuntu is great on old machines. I put it on my old XP and it works like a charm - faster than XP and never has crashed (like XP). Hi Organic_Marble. I'm glad to hear that Lubuntu is working for you. Thanks for reading and for sharing your experience. Great post! Our family is facing the same challenges of replacing XP on old hardware, and we too have chosen Lubuntu. So far, so good! The only real speedbump seems to be iTunes. Chris, I feel your pain! IMO, the Linux infrastructure is still not ready for prime time as far as the uninitiated are concerned. There's still a lot more accessible help available for the non-tech-savvy in the Windows world. I haven't tried all the alternatives, but Lubuntu has proven "good enough" if not ideal. Love Linux. Open source is pure beauty, especially in the graphic arts. Not sure about Lubuntu, though. We've been trying different environments for Ubuntu, including Lubuntu, Mint, and KDE. They're a big improvement over Unity, but they're somewhat buggy and not as user-friendly as we'd like. Worlds improved over Windows, though - much lower stress. 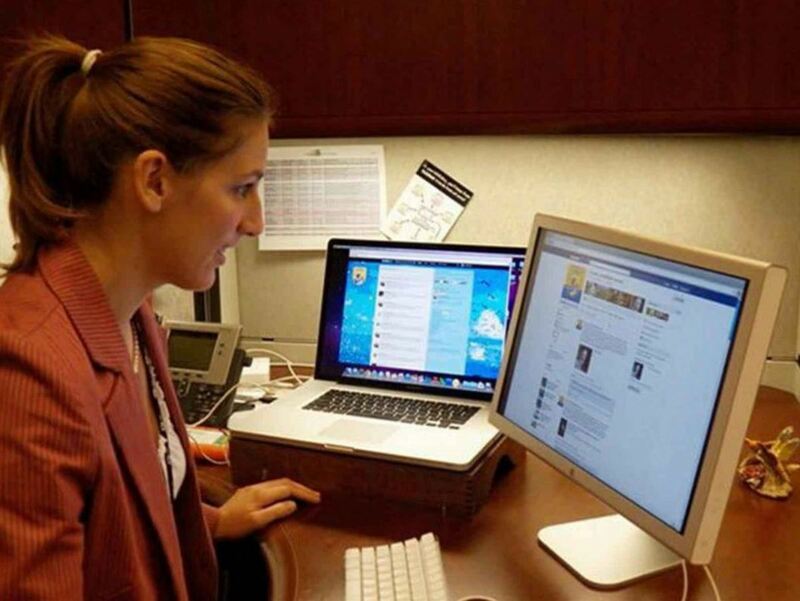 Still we haven't found the environment that will enable this non-tech-savvy user to totally customize the desktop. Almost at the point where I'm considering GNOME...! Darnitall, I've spent years procrastinating getting a technological clue, waiting for the infrastructure to spring up for me. When, oh, when, will it happen? Thanks, booknow. You're right about the Linux community, and I did get some help from forums. But for most Windows users, even interacting in a forum is a foreign experience with its own learning curve. Thanks for the info on Bible software. I'll have to see what's available. Great hub. I agree Lubuntu is a great alternative for XP. What is really nice about open source software, like Lubuntu and Ubuntu, that it has a great community. If you have questions or problems you can make a post at the ubuntu forums (http://www.ubuntuforums.org) or at askubuntu (http://www.askubuntu.com). Ps. Ronald there is also open source bible related software available in the Lubuntu/Ubuntu software center. SmartKeyboards, I'm not much of a gamer myself, so I have to admit ignorance of how good Lubuntu is as a game platform. I know there are a bunch of Linux-based games, but whether the selection is as wide as for Windows, I don't know. Ive wanted to try linux but i am a gamer. and i don't think most my games would play on it. Actually, Lubuntu does not come with LibreOffice installed by default (it does have AbiWord and Gnumeric for spreadsheets though). It is however, easy enough to install LibreOffice via the Lubuntu Software Manager from the "start" menu. Thanks, Mike. I hadn't heard of Knoppix, so that's good info to check into. I have just installed Knoppix on a 2005 1 7gh Centrino based laptop which had become so slow under XP as to be unusable even before support was pulled. I had a long session trying to load various distros without success due to a bios problem with the machine. 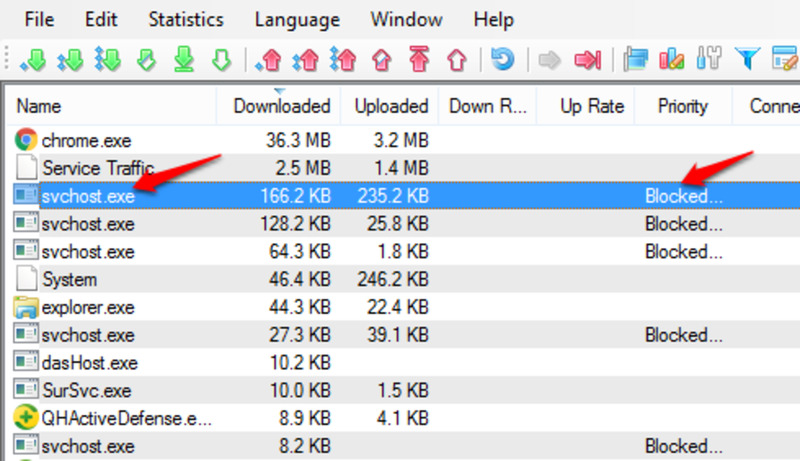 Ubunto originally loaded but when I installed to HD would then not start at all! Unlike the others Knoppix is more like a recovery disk and did not hang on boot from the cd drive. The menu included an option to install to HD which was straight forward. Underneath Knoppix is Debian and like Lubuntu it runs the lxde desktop so looks very like the video above. Knoppix gets my vote because it rescued a dead machine which now starts and runs for core applications faster than my i5 Win 7 laptop used for work. I like the netbook option in Lubuntu and will give it a try. Thanks for the helpful article. Hi, DzyMsLizzy. I didn't mean to scare you! First, some good news. Lubuntu comes with LibreOffice installed. 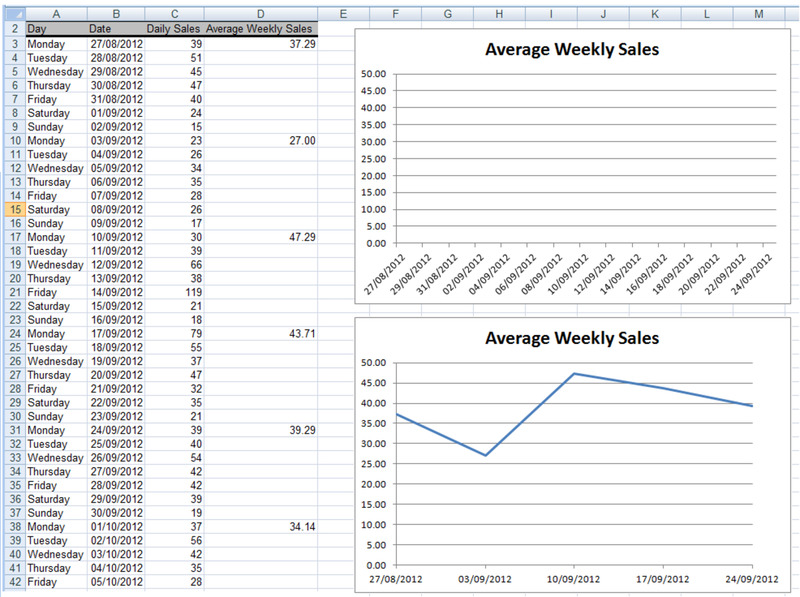 LibreOffice, which is also available for Windows, gives you equivalents to all parts of the Microsoft Office suite. The Writer app in LibreOffice is like MS Word 97/2000/2003. 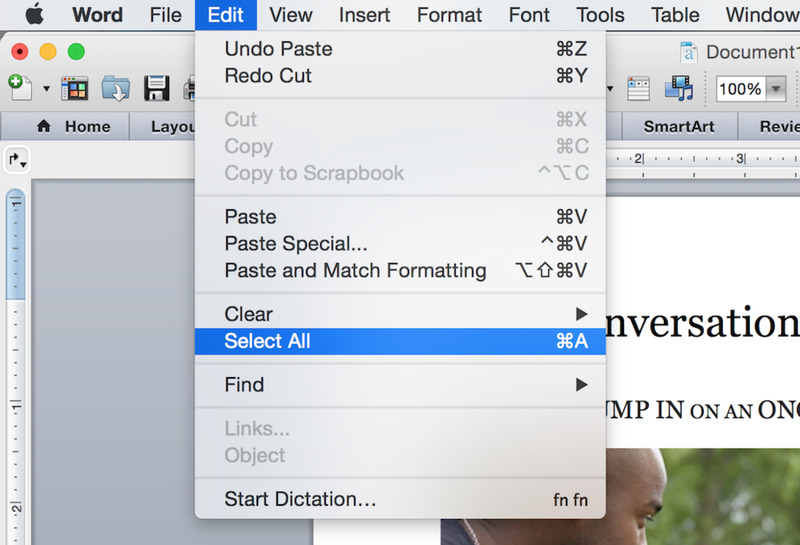 It can both read and save documents in .doc or .docx formats. So you'll have no problem with that. Now, here's some even better news. Please take a look at my hub about using Wubi to install Lubuntu under Windows. Wubi makes getting going with Lubuntu dead easy, without requiring you to make any permanent changes to your XP system. You can play around with Lubuntu while retaining the ability to go back and forth to XP until you're comfortable in the Linux world. Since Wubi is actually a Windows app, both you and your husband might find it an easy way to check Lubuntu out. For me learning about Lubuntu, and Linux in general, has been a little-step-by-little-step thing, rather than having to climb some huge cliff all at once. Give Wubi a try. I'll be happy to help if I can. The Wubi hub is at http://hub.me/agqcW. Yeeks! It sounds good up until the last section. I don't have that kind of technical knowledge AT ALL, and hubby never worked with Unix/Linux in his former career as a hardware/software configuration manager. He won't know what to do, either. Nor does he currently have the patience to deal with a learning curve, and probably could not, due to his disability, the medications for which have affected his memory. Thanks, IStogramma. I appreciate the info, which I can certainly use. Thanks, Patkay. I've seen accounts of people running Photoshop with Wine. I'm not sure about Corel. My problem with Photoshop is that I never figured out how to use it even in Windows! GIMP is available in the Lubuntu Software Center, so that will be my first choice. A very informative hub. At the moment, I am running Linux Mint 13 LTS. So far everything is okay expect that I have problems with WINE. I cannot install programs like Corel or Photoshop. They end up crashing. I think I will try Lubuntu and see how it works. Thanks, cmoneyspinner1tf. I certainly don't mean to make you feel stupid, although I think it's probably natural for any of us being exposed to the UNIX world for the first time to feel that way! Hi, cmoneyspinner1tf. Actually, you're right. Ubuntu is a Bantu word from southern Africa having to do with the oneness of humanity. It was deliberately chosen for the operating system to express that idea in the computer world.